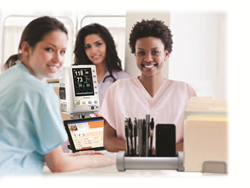 CareConnection's vitals and weights now flow directly from bedside to AOD Software, improving care, saving time, eliminating documentation errors and providing immediate alerts of resident health conditions. "Delivering vitals and weights directly to the resident's record improves care, saves time and eliminates documentation errors." Constant Care Technology, LLC, the leading provider of medical device integration systems specifically designed for the long-term and post-acute care (LTPAC) industry, today announced the integration of its CareConnection® connectivity platform with AOD Software’s electronic health record system. AOD is a leading provider of software solutions to senior living with a particular focus on Continuing Care Retirement communities. By eliminating manual entry of vital signs and weight information, providers can save documentation time, improve accuracy, and expedite the flow of critical clinical information from bedside to the resident’s electronic chart. AOD’s software used for documenting activities of daily living can also be accessed on the CareConnection Vitals Care Cart CareHub tablet, giving customers a mobile kiosk option that reduces overall hardware investment. For more information on the benefits of integration between AOD and Constant Care Technology’s CareConnection, visit http://www.constantcaretechnlogy.com. Constant Care Technology is the leading provider of advanced medical device integration and telehealth systems specifically designed for the long-term and post-acute care (LTPAC) industry. Company products include CareConnection™, the first FDA-cleared medical device integration solution designed specifically for LTPAC, and LILAH (Living Independent Life At Home), which supports remote monitoring and care for patients as they transition to home from hospitals or post-acute care facilities and for patients in assisted living or independent living care settings. For more information on Constant Care Technology’s solutions, visit http://www.constantcaretechnology.com. AOD offers a fully integrated software system comprised of clinical, financial, point of sale and operational solutions to track a resident through the continuum of care regardless of business line and without duplicate entry. AOD has been serving the long term care industry since 1995 and was recently acquired by MatrixCare®, making MatrixCare the largest provider of EHR solutions for long term care and senior living providers in the United States.